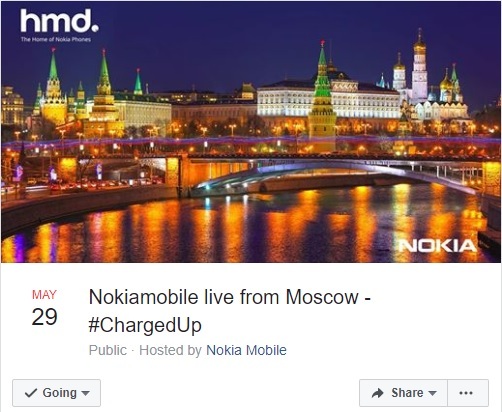 Nokia Mobile, or HMD Global, is holding an exclusive event in Moscow, Russian Federation on May 29th. The event will start at 19:00 Moscow Time (18:00 Central European Summer Time), and last for two hours. The best thing about that event is that you will be able to follow it live on the Nokia Mobile Facebook page. Another great thing about it is that Nokiamob will be there, as you already know (or not), and cover it all as much as we are able to. Stipe will be going to Russia, where he will be shooting everything with Nokia 7 plus camera, so you can expect great photos of new devices. We still don’t know what will be shown at the event. Many new phones with unseen model numbers have passed the certification process just before the event. Also, that #ChargedUp hashtag could be revealing something. Maybe HMD plans to break the record in smartphone battery longevity, or the tag could represent the new Nokia 3 and 5 which are going to be completely overhauled and charged up with better hardware than the original models. Anyway, we are ready for the event and if you want to follow it, just click the Facebook link below the post or check Nokiamob on Tuesday afternoon.